I know it seems that I'm jumping around in my restore/rebuild journey, but as many know, I am a total newb at this and it's winter here in Virginia and my car basically came to me as a box of parts. My dash is getting covered (in leather no doubt) at no charge to me. Pity I don't get to do it myself, but I had gone to a vinyl expert (does some really wild vehicle wraps) to get advice and meet his welder. My brother in law (the vinyl guy) wanted to do the whole thing in CFG (carbon fiber graphite) and was going to do it on the spot but I begged off since I want as original as possible (within budget). He made a call, and someone he throws business too said they could do it. Before I knew it he's taking my dash from me and in back to clean it up (a tiny amount of smoothing and a dent that was so small I didn't even see it). He came back out and said he'd call me in a few days when his friend finished it. I had already shown him the pics of the dash in the original condition since we had been talking about the grain (and color) of the dash. But I digress (per usual). So the welder and I hit it off, and he's going to come over and check out the project. He's offered to do whatever welding I need (since he's on my brother in laws payroll) and I'm actually pretty excited. I have to finish bolting the rest of the body down and getting it all aligned before he come over to weld. About this time I get a text from my dad, and his interior kit has arrived from TRF and he wants me to see (we both get rather excited about our cars). I head on over in time to catch the mailman and he has yet another package from TRF for my dad, and it's a new ignition switch (another story, another time) to go with the key-matched set I got him for Christmas. The one that was on his car was some JC Whitney special he installed way back when and actually forgot he did it. So we're sitting there chatting and I'm drooling over his interior kit (mine is black, but his is the most awesome biscuit tan (a bit darker and redder than you normally see) and I see my seats sitting there on the shelf untouched so far and I get a wild hair to really go through them. There is some rattling inside and I pull the lower cushion up to find the rails and bolts loose (PO must have stored them in there) and the pans are a bit dusty and there's some rusty dust. I wipe it up a bit and there's black paint showing through, hmmm. The bolt holes are nearly pristine, and except for the paint being a bit dull, the pans look pretty good, on both sides (in and out). I expected a lot more rust based on the amount of rust dust that was laying in the bottom of the pan. The seat bottom has horsehair showing through, so I turn it over and low and behold, my springs are barely recognizable as springs. Crap. I pull the other bottom out and not nearly as much dust. The fabric is worn and split but I can't see horsehair easily. Those springs are pretty oxidized but very nearly savable. I notice the bottom cushions very much resemble each other in shape, but the stitching pattern is different, and to make me even more confused, both seats fold. Sorry I forgot to snap some pics of the seats, but I will do that on my next day off. There was a time (20+ years ago) when replacement springs were not available and I went with a built-up foam for the base. Has be excellent and has held up fine. I like to sit a bit high and had then built that way. OTOH, I think spring are now available so you have options. He builds compete seats including frame padding and covers. Neither seat folds. No springs or horse hair, he uses high density foam throughout. I have had them about 5 years now and they still look new. I wonder if he would sell just the base innards? 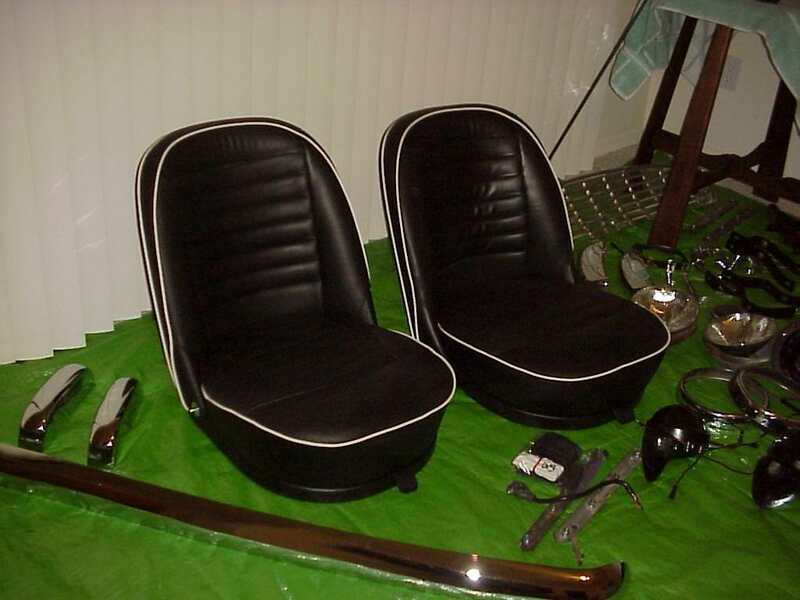 I've seen his stuff, I was intrigued, but I have (mostly) two complete seats, pads, horsehairlike stuff and frames. I hate to chuck all that (though the instantaneous gratification would know no bounds!). I'll drop him a line and see what he's about. I thought his member ID seemed familiar. Like he posted here or on the TRExperience site. Can't hurt to ask him. He has been very accommodating in the conversations I have had with him and has been willing to make custom pieces for me. He also covers the cockpit cove molding if you send him the metal frames. The dog leg pieces behind the doors are extremely difficult to cover without getting wrinkles in the bends but his came out perfect. Very good craftsmanship and attention to detail. yeah, there are some real gems on ebay! I've mostly had great luck with it and I have been buying, and occasionally selling since 96, or 97. I get a lot of loose electronics (ipods, cameras and stuff) fix them up and sell them on ebay. I try to make good with all my customers, and never give a hassle on returns. I don't sell on there as a living, just when I get stuff that I can't or won't use. Keeping them out of the landfill and all that. Almost sent John a new (to him) camera when he posted that his flash had died. Then I noticed the post was a couple of years old. John, if youre on and need a camera (point and shoot) I might have one or two with your name on it. There is listing there for TR3 seat springs. These are not mine... and know nothing about them.... just saw the ad. The Roadster Factory invested in a better set of seat springs, and if you use new springs you should definitely check those out. I got my seat springs from Jonathan Skinner. They are excellent. Looked almost exactly the same as the original ones I had. My DPO rebuilt the seats by adding an inch of foam over the existing seat covers and then adding another cover. They look great but the steering wheel rubbed on the thighs. Since I needed a new steering wheel anyway I bought one that is 2" smaller in diameter. Works great and looks nice. I just say this to warn you that more padding is not always better. Skinner doesnt seem to list a price but TRF wants 299 for one, and I might need two. the guy on eaby hasn't gotten back to me, but a full set in leather starts at 899. Im really considering HDF to replace the springs until I can do more original. Looking at my J. Skinner invoice I paid $197.00 for the pair with my order. That was 2017. John Skinner doesn't post prices, they quote on request. I had a quote last fall of £82.96 each, which is $106.18 at today's exchange rate (1.28). This was for the earlier seat springs (TR2-3, pre-TS20014). Now that is worth tracking down Keith. Do you happen to remember what shipping would have been? I'm not entirely sure that I need two, but at that price I might just jump. I feel like I am going about this restore all backwards, but my interior came mostly complete and in packages. I'm finding little things missing here and there and trying to track down individual things that are normally found in a set or kit. Oh well, it's a journey, not a race. My winter projects were: Sort the parts (mostly done) dash (98% done), finish welding the tub (not even started) seats (set back a bit) and find sources (will never be truly complete). J. Skinner gets an email as soon as I finish posting this. They'll quote shipping; mine was part of a complete interior and weather gear kit. If you go to their website, they have a quote request link. They respond in 24-48 hours and the quote is good for 90 days. Mine was the same. Part of a complete kit of trim. The order in which you do things does not matter much. You are still sorting stuff out and finding what is there or not. The first thing I did on my TR3 kit was getting the center instrument panel painted with crinkle paint and most of the gauges in it. I had taken the first step in my mind. It is a long journey not a sprint. Bought my foam-only kit from 2tall on ebay a few years ago. Covers were from Moss. I really disliked the bouncy springs and much prefer the foam for comfort. YMMV from my likes. 2tall did finally get back to me, though we've been playing a bit of tag due to our snow storm. Skinner got back to me as well, and get the idea that you can only buy a pair from him. If I want stock, he's the way to go. 77 pounds British per unit, 215 total with shipping. For now it will be foam, even considering doing it myself. Can't seem to find more than one kind of high density (just thicknesses). Get, the foam, a piece of plywood, adhesive and staples. I covered the foam with some angel hair gauze from the fabric store to keep it from being abraded by the cover. This view from the bottom shows you how to fold and staple the cover. Easy peasy.